1. For noise abatement, pilots intending to depart crosswind from Palo Alto Airport's Runway 31 must instead request named departures that include what local bridge? 2. San Carlos pilots must be aware of what limitation to getting automated weather at Palo Alto airport? 3. 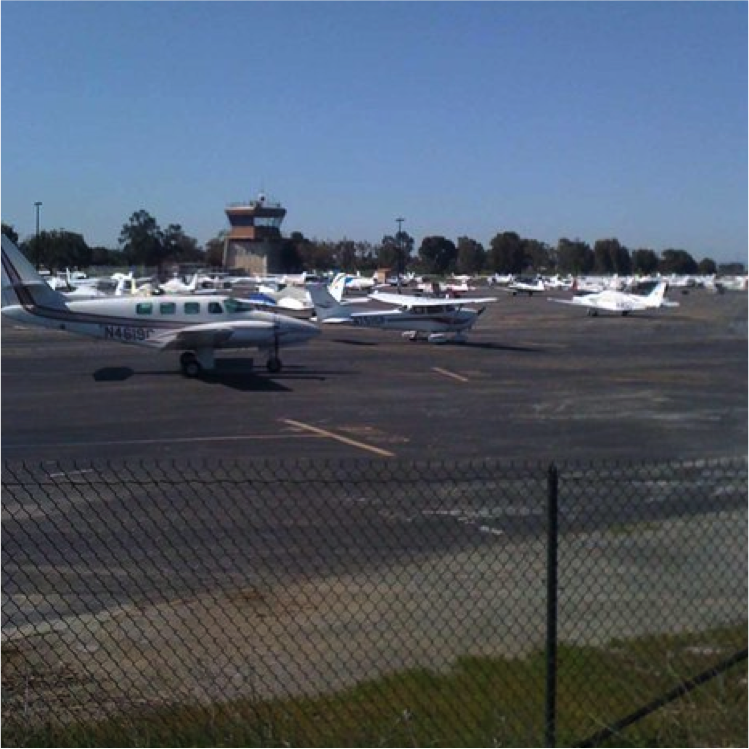 What is unusual about the Ground Control frequency at Palo Alto Airport? 2. PAO ATIS is not available when the tower is closed. No AWOS. 3. Its frequency is not 121.x, which is commonly used for ground. It is 125.000. We are excited to announce that SCFC has leased a handful of tie-downs at PAO, starting out with spots for four C152s and C172s. There will be a lockbox with aircraft keybooks, and a supply of aircraft oil and equipment. If you check the online schedule, you'll see it now shows two airport locations so you'll know which aircraft are at which airport. Why Palo Alto? SQL doesn't have enough tie-downs left to keep up with the growth of the Flight Center. Now, we have rental options for San Carlos Flight Center members who live and work farther south on the peninsula and in San Jose. Members, please consider yourselves SCFC's ambassadors to Palo Alto. Airport staff, controllers, and other pilots may have questions as we settle into this expansion. Please help them understand SCFC's values of Safety, Community, and Adventure, and our commitment to being a positive addition to Palo Alto Airport. SCFC Simulator Center - Now with Helicopter! 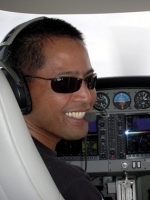 Once again, San Carlos Flight Center leads the way in flight simulation training. We have acquired a new helicopter simulator! 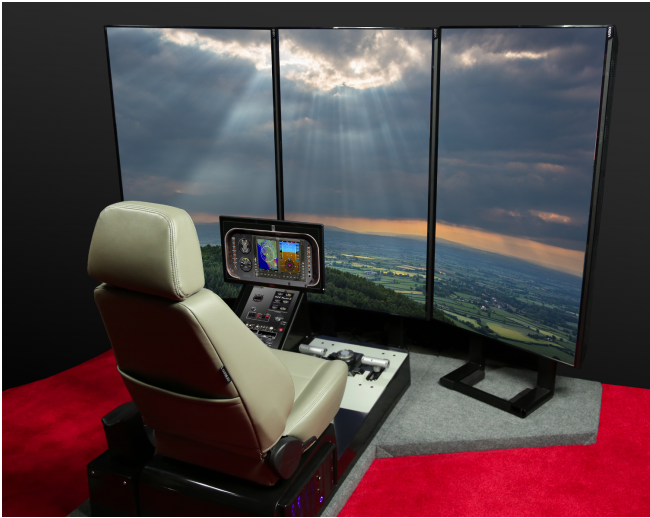 The stunning new simulator should cut hundreds of dollars off of helicopter training and joins our 3-screen G1000 airplane simulator downstairs in a new expansion office suite devoted to simulator training. Grab your favorite flight instructor and come try out simulated hovering, autorotation, and helicopter emergencies. The Sim Center is in Suite 123A of the Skyway Building, just downstairs from SCFC. SCFC is excited to welcome our first Cessna 210 Centurion to the fleet, N9402TN. This normally aspirated, complex aircraft offers 260 HP, retractable gear, and a usable load greater than our C182s. Make this your choice for the next weekend trip to Las Vegas or Seattle. Look for the brash colors of this powerhouse nestled among the rest of SCFC fleet or on the next FlyOutGroup trip to Colorado. The introductory rental rate for SCFC Members is only $210/hr. SCFC continues to be one of the largest and most diverse aircraft rental fleets in the SF Bay Area. Our growing membership deserves a growing fleet. 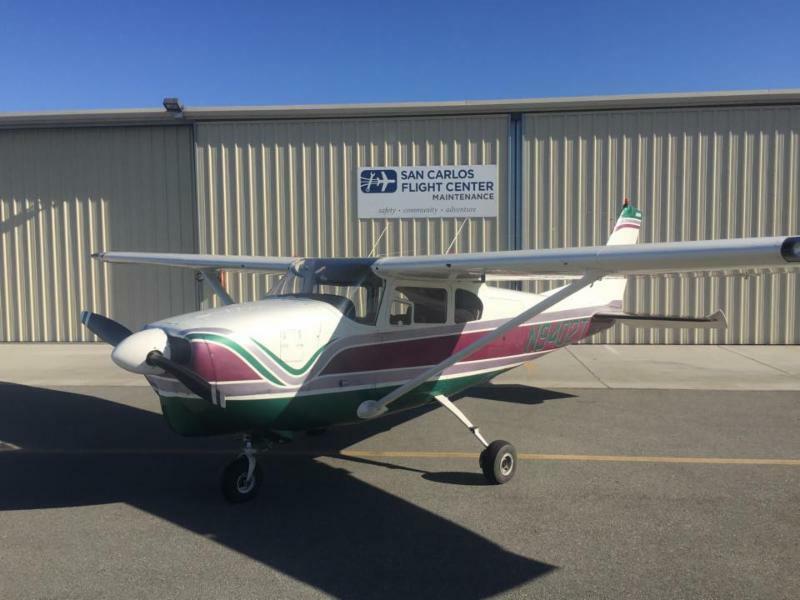 If you are interested in sharing your aircraft with the safe, competent pilots of San Carlos Flight Center, contact Dan Dyer at dan@sancarlosflight.com. A thorough preflight often includes a check of movement of the flight control surfaces, but use caution. 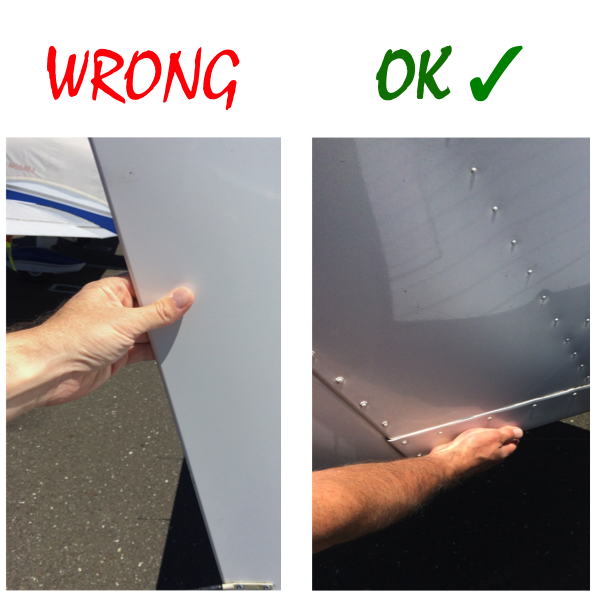 Some manufacturers prohibit movement of the rudder or other control surfaces by hand due to the way the controls are rigged. Forcing a control surface to move can damage the control surface itself or cause damage to connector rods, pulleys, or turn buckles. Before moving any control surface, check with a SCFC mechanic and the aircraft POH to see if this is allowed by the manufacturer. Even for aircraft that allow external movement of the control surfaces, use caution. Flight control surfaces are often not structurally able to withstand movement from the middle of the surface. Grab only on reinforced ends of the control surface and move gently. 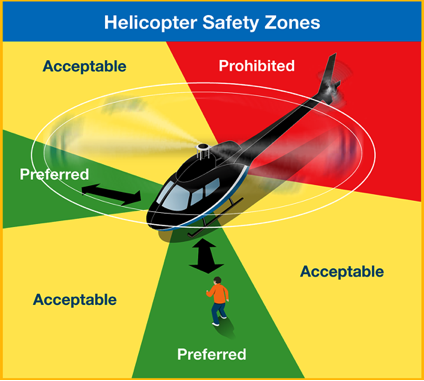 With helicopters at SQL, it is important that everyone is aware of how to stay safe around helicopters. Most people know that the propeller on the front of an airplane is dangerous and should be avoided. With helicopters, the biggest danger is the tail rotor at the rear of the helicopter. The tail rotor in a helicopter spins at more than 2,000 RPM and can be difficult to see, making it a deadly hazard for unaware persons. When walking in the vicinity of a helicopter, follow these guidelines. 1) Stay well away from any helicopter while the rotors are turning, especially remain well clear of the rear of the helicopter. 2) Always approach a helicopter from the side or the front, and never out of the pilot's line of vision. 3) When exiting a helicopter, always exit toward the front, and never reach up or run after a loose object that might have blown away. Follow these simple guidelines to keep you and your loved ones safe around helicopters. Cooler autumn air can provide for some great overnight trip destinations. What's cooler than taking yourself to Truckee or Mammoth for a weekend?! 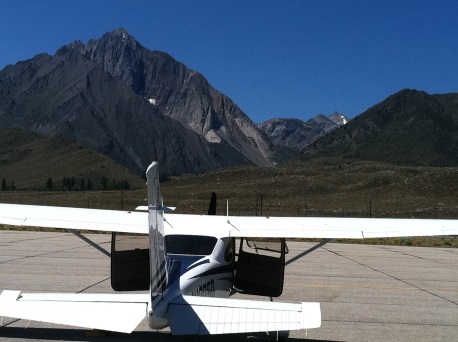 For many of us, getaway trips are a big part of why we learned to fly. SCFC allows overnight rentals, but you do need prior approval for overnight flights or flights made out of state. Make your reservation, then get in contact with the Chief Pilot to discuss route, destination airports, flight time on the engine, and whether any additional training may be required prior to the flight. Advanced planning helps the SCFC Maintenance team ensure that your multi-day flight is not at risk from minor squawks or routine maintenance. 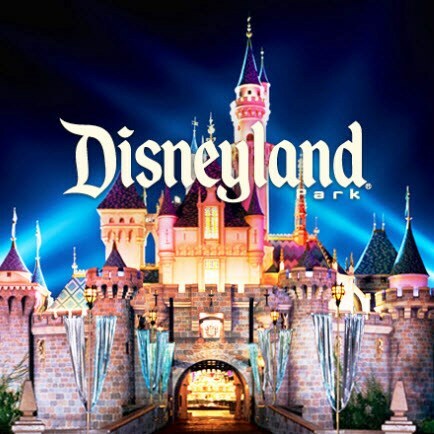 Call us (650) 946-1700 or email us when you have your trip dates planned out, and we'll make sure that both the plane and you are ready for the adventure. SCFC: How long have you been flying? AE: For about 14 years. When I was about 5 or 6 my dad took me out to the middle of the desert in California and said "look up". We were on the edge of one of the military training bases. I saw the planes and was instantly hooked. In 2001, I finally bit the bullet and said "no matter what I'm flying". SCFC: You fly a lot of different types of aircraft, what are some of the more memorable ones? AE: Lately, I am really loving the BT13 Valiant. Since I was young, all of my heroes have been WWII pilots; whether they were American, Japanese or German. Every Allied pilot had to train in the BT13, and for me to sit down in an aircraft and essentially hear, feel, smell, and see what they saw is amazing. I also love the Cessna 120, because it is so nostalgic. It is back to basics flying. There is no autopilot, no GPS, it's just you, stick, rudder, and throttle. I'm taken back to the days after WWII when former military pilots could get into a Cessna 120 and fly across the country. SCFC: What big flights do you have coming up? AE: I've become involved in the annual reunion of WWII WASP pilots. The next one is in Sweetwater, Texas in May of 2016. Sweetwater is where the WASP program was founded and where they all went for their initial training. 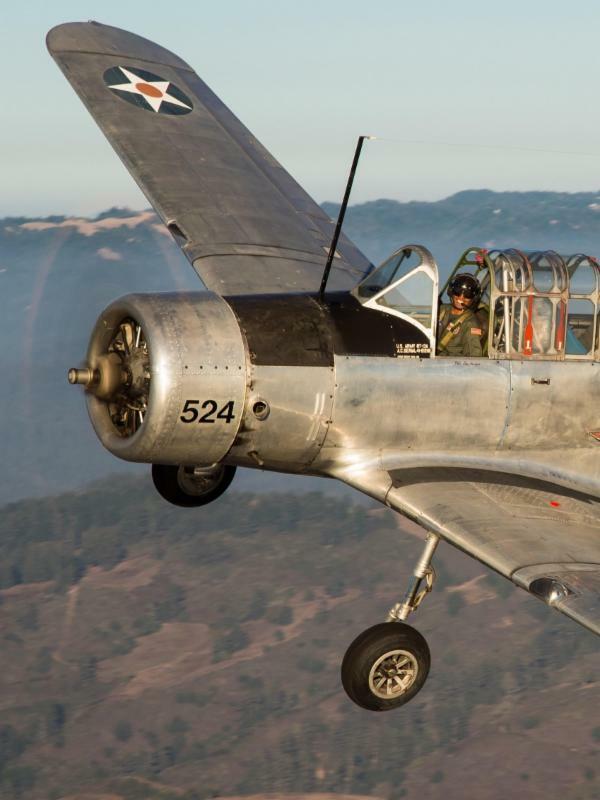 I'm raising money to fly a BT13 from the Bay Area to their reunion in honor of them. SCFC: What would you tell somebody trying to decide if becoming a pilot is right for them? AE: I would tell them to go up in an aircraft. Find a flight school that can give you an orientation ate get up in the air. Only when you are in an aircraft at 1,500 feet in the air looking down at the beautiful SF Bay AREA will you truly know if flying is for you. SCFC's Young Aviators Weekend program (YAW) travels to San Francisco for SF Fleet Week this Sunday, October 11. 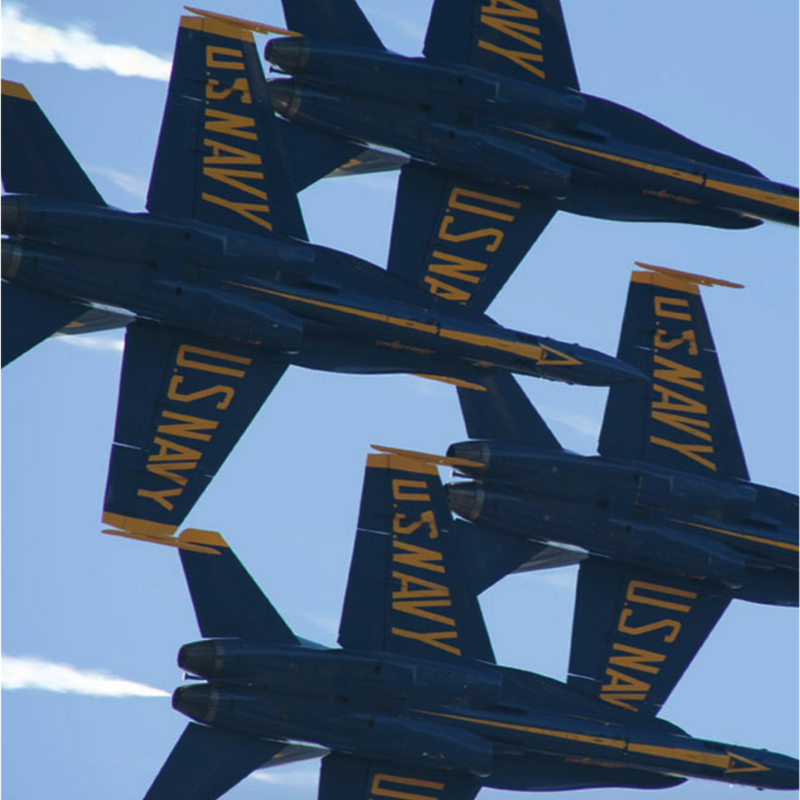 The young pilots in YAW will go for front row seats as the U.S. Coast Guard conducts a rescue demonstration, the Blue Angels perform aerial acrobatics, and the U.S. Navy's Leap Frogs parachute team perform precision jump maneuvers. YAW is a fun, informative, activity-based club for high school students with an interest in aviation. Activities include tours of various areas of the airport and control tower, and meetings with mechanics, pilots, and others who work in aviation. Tell your children, nieces, nephews, and grand kids about YAW and help us support the future of aviation. San Carlos Flight Center is now a proud supporter of the College of San Mateo's baseball team. Go Bulldogs! Join SCFC members in cheering for our team at all of the home games at CSM, and help us support the team's fundraising efforts at the 18th Annual John Noce Classic at Poplar Creek Golf Course in San Mateo on October 23rd. SCFC is an active participant in local community events and is always looking for ways to share our love of aviation with worthy local schools and charities. We thank CSM Head Baseball Coach Doug Williams for bringing us this exciting community opportunity. 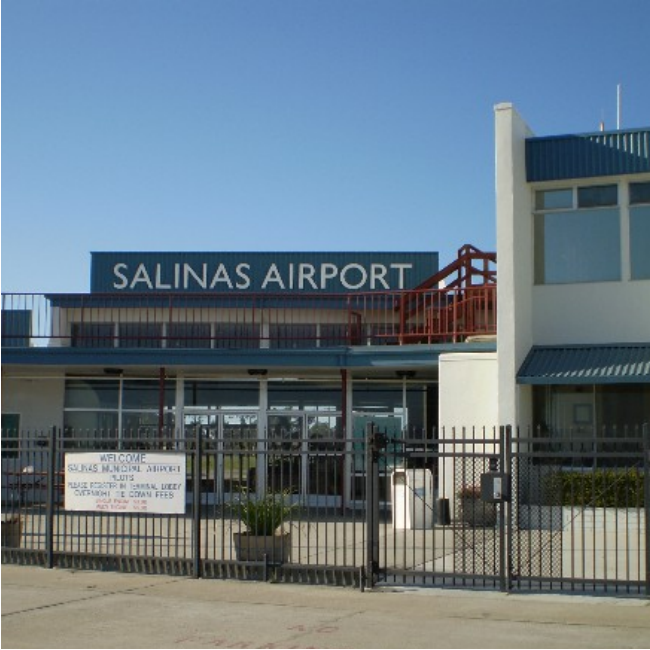 Our FOG Lunch destination for October is Salinas, and what great hopes we had. We had hoped to convince The Landing Zone restaurant on the field to open special for FOG on Sunday, October 11. Sadly, we were not successful. Welcome Plan B! We will still journey to Salinas, but instead of a restaurant the FOG group are bringing their own delicious sandwiches and side dishes. It's a FOG picnic! Sign up on the FOG site to bring a tasty lunch, a refreshing beverage, and/or something else to share with the FlyOutGroup. We will bring some utensils, napkins and condiments. FOG Picnic in Salinas (KSNS) is the perfect opportunity for logging a cross-country flight while bringing along friends and family members who may enjoy the fun. Remember, a good pilot is always prepared. Plan ahead and help us make this FOG Picnic a success! How many pilots does it take to get through a corn maze? Join the Fly Like a Girl women's pilot group on Sunday, October 25th and help us find out. The women of FLAG are taking the customary FOG lunch flight and adding a fun Halloween twist. 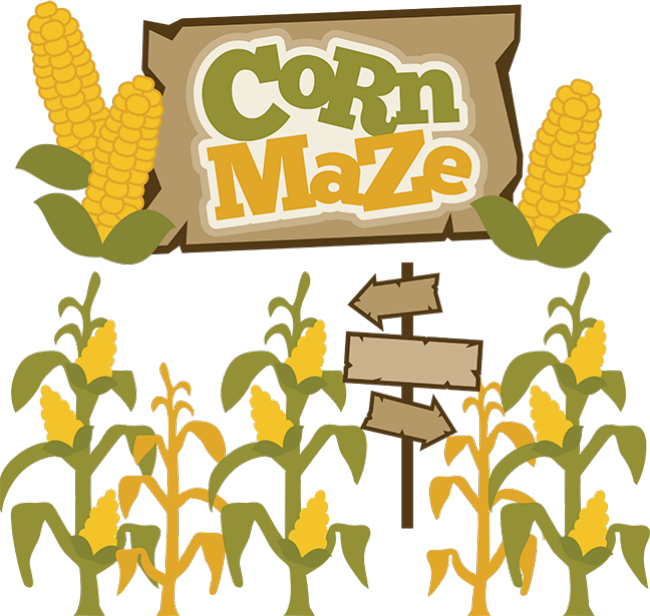 Tucked inside the intersecting runways at Hollister Airport is Swank Farms, and each year they turn their farm into an impressive corn maze, pumpkin patch, and kids' activity corner. This event is a perfect opportunity to bring along a friend, spouse, and/or your kids to show them how much fun flying is. All our welcome: women, men, kids, zombies, ghouls, and witches. Sign up now with FOG and plan to meet us in the transient parking area at the Hollister Airport (KCVH) at 12:00pm. This month under the light of a full moon FOG will journey to Monterey Airport (KMRY) for dinner at the Golden Tee Restaurant. Clear skies will hopefully allow us to reach this great nearby airport which we have not been to in months. 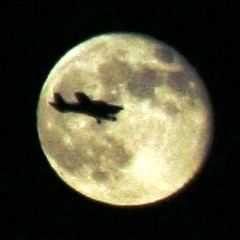 Each month, several FOG pilots take part in the Full Moon Flyers dinner flight. Some are out of night currency, so they fly alone or bring along a CFI. Some are night current and bring along friends. Some student pilots grab a CFI to fulfill the night cross country requirement in a more fun and social way. Come along and join us for a social group dinner, followed by a beautifully moonlit flight back home.